Despite the ongoing merger, it was a commonly held view that the NFL was a far superior league. This was seemingly confirmed by the results of the first two interleague championship games, in January 1967 and 1968, in which the NFL champion Green Bay Packers, coached by the legendary Vince Lombardi, easily defeated the AFL's Kansas City Chiefs and Oakland Raiders. Although publicized as the inter-league championship games, it was not until later that the moniker for this championship contest between the now two conferences (National and American) began having the nickname of "Super Bowl" applied to it by the media and later began being counted by using Roman numerals, the creation of the term being credited to the founder of the AFL, Lamar Hunt. The Baltimore Colts had won the 1958 and 1959 NFL championships under Coach Weeb Ewbank. In the following years, however, the Colts failed to make the playoffs, and the Colts dismissed Ewbank after a 7–7 record in 1962. He was soon hired by New York's new AFL franchise, which had just changed its name from the Titans to the Jets. In Ewbank's place, Baltimore hired an untested young head coach, Don Shula, who would also go on to become one of the game's greatest coaches. The Colts did well under Shula, despite losing to the Cleveland Browns in the 1964 NFL Championship Game and, in 1965, losing in overtime to the Green Bay Packers in a tie-breaking game to decide the NFL Western Division championship. The Colts finished a distant second in the West to the Packers in 1966, and in 1967, with the NFL divided into four divisions of four teams each, went undefeated with two ties through their first 13 games, but lost the game and the Coastal Division championship to the Los Angeles Rams on the final Sunday of the season—under newly instituted tiebreakers procedures, L.A. won the division championship as it had better net points in the two games the teams played (the Rams win and an earlier tie). The Colts finished 11–1–2, out of the playoffs. In 1968, Shula and the Colts were considered a favorite to win the NFL championship again, which carried with it an automatic berth what was now becoming popularly known as the "Super Bowl" against the champion of the younger AFL. The NFL champion, in both cases the Green Bay Packers, had easily won the first two Super Bowls (1967 and 1968) over the AFL winner, establishing for a while then the superiority of the older NFL circuit. Baltimore's quest for a championship seemed doomed from the start when long-time starting quarterback Johnny Unitas suffered a pre-season injury to his throwing arm and was replaced by Earl Morrall, a veteran who had started inconsistently over the course of his 12 seasons with four teams. But Morrall would go on to have the best year of his career, leading the league in passer rating (93.2) during the regular season. His performance was so impressive that Colts coach Don Shula decided to keep Morrall in the starting lineup after Unitas was healthy enough to play. The Colts had won ten games in a row, including four shutouts, and finished the season with an NFL-best 13–1 record. In those ten games, they had allowed only seven touchdowns. Then, the Colts avenged their sole regular-season loss against the Cleveland Browns by crushing them, 34–0, in the NFL Championship Game. Jets quarterback Joe Namath threw for 3,147 yards during the regular season, but completed just 49.2 percent of his passes, and threw more interceptions (17) than touchdowns (15). Still, he led the offense effectively enough for them to finish the regular season with more total points scored (419) than Baltimore, and finished fourth in completion percentage, fifth in touchdown passes, and third in passing yards as one of only three quarterbacks to pass for over 3,000 yards in the AFL that season. More importantly, Namath usually found ways to win. For example, late in the fourth quarter of the AFL championship game, Namath threw an interception that allowed the Raiders to take the lead. But he then made up for his mistake by completing 3 consecutive passes on the ensuing drive, advancing the ball 68 yards in just 55 seconds to score a touchdown to regain the lead for New York. Future Hall of Fame wide receiver Don Maynard caught the game-winning pass in the end zone but strained his hamstring on the play. After the Jets' AFL championship victory, Namath stated to The New York Times sportswriter Dave Anderson, "There are five quarterbacks in the AFL who are better than Morrall." The five were himself, his 38-year-old backup Babe Parilli, Lamonica, John Hadl of the San Diego Chargers, and Bob Griese of the Dolphins. Namath added, "You put Babe Parilli with Baltimore instead of Morrall and Baltimore might be better. Babe throws better than Morrall." Despite the Jets' accomplishments, AFL teams were generally not regarded as having the same caliber of talent as NFL teams. However, three days before the game, Namath appeared at the Miami Touchdown Club and boldly predicted to the audience, "We're gonna win the game. I guarantee it". Coach Ewbank later joked that he "could have shot" Namath for the statement. Namath made his famous "guarantee" in response to a rowdy Colts supporter at the club, who boasted the Colts would easily defeat the Jets. Namath said he never intended to make such a public prediction, and would not have done so if he had not been confronted by the fan. Sportswriter Dave Anderson did not think that the remark was notable because, he recalled, Namath had said similar things during the week ("I know we're gonna win" for example), but an article by Luther Evans of the Miami Herald made the statement famous. Namath's comments and subsequent performance in the game itself are one of the more famous instances in NFL lore. The Colts, linebacker Curtis recalled, "sort of laughed at" Namath's guarantee. The team did not adjust the defense it had used during the season against the Jets because "that should be good enough", Curtis said. The AFL champions shared the confident feelings of their quarterback. According to Matt Snell, all of the Jets, not just Namath, were insulted and angry that they were 18-point underdogs. Most of the Jets considered the Raiders, whom they barely beat (27–23) in the AFL title game, a better team than the Colts. Indeed, watching films of the Colts and in preparation for the game, Jets coaching staff and offensive players noted that their offense was particularly suited against the Colts defense. The Colts defensive schemes relied on frequent blitzing, which covered up weak points in pass coverage. The Jets had an automatic contingency for such blitzes by short passing to uncovered tight ends or backs. After a film session the Wednesday prior to the game, Jets tight end Pete Lammons was heard to drawl, "Damn, y'all, we gotta stop watching these films. We gonna get overconfident". New York entered the game with their primary deep threat, wide receiver Don Maynard, playing with a pulled hamstring. But his 112-yard, two touchdown performance against the Oakland Raiders in the AFL championship game made the Colts defense pay special attention to him, not realizing he was injured. Using Maynard as a decoy—he had no receptions in the game—Joe Namath was able to take advantage of single coverage on wide receiver George Sauer, Jr.. (After studying the Colts' zone defense, Ewbank had told his receivers, "Find the dead spots in the zone, hook up, and Joe will hit you.") The Jets had a conservative game plan, emphasizing the run as well as short high-percentage passes to minimize interceptions. Meanwhile, with the help of many fortunate plays, the Jets defense kept the Colts offense from scoring for most of the game. Also, Baltimore had a distinctly older group of players with 10+ years experience (Braase, Shinnick, Lyles, Boyd) on their defense's right side versus New York's younger, bigger left offensive side (Hill, Talamini, Schmitt, Sauer)--and back Snell when running left behind left tackle Hill, who thoroughly defeated defensive end Braase. Namath recalled that he did not become "dead serious" until, on the sideline before the game, he saw Unitas. The Jets, led by captains Namath and Johnny Sample, and Colts, led by captains Preston Pearson, Unitas, and Lyles, met at midfield where referee Tom Bell announced that the Jets had won the coin toss and had elected to receive the football. The coin toss had been conducted an hour prior to kickoff but this was done for the benefit of the spectators. Colts kicker Lou Michaels kicked the ball off to Earl Christy who returned the ball 25 yards to the Jets' 23-yard line. Namath handed the ball off to Snell on first down who carried it 3 yards. On second down, Snell carried the ball for 9 yards, earning the Jets their first first down of the game. Colts' free safety Rick Volk sustained a concussion when he tackled Snell and was subsequently lost for the game. On the ensuing play, Emerson Boozer lost four yards when he was tackled behind the line of scrimmage by Don Shinnick. Namath threw his first pass to Snell that gained 9 yards on 2nd and 14, but a 2-yard loss by Snell on the following play forced the Jets to punt the ball. The Jets noticed, however, from watching film the predictability of the Colts' defense based on how players lined up. Instead of calling plays in the huddle, Namath usually gave formations to his team and operated from the line of scrimmage. Center John Schmitt recalled that the Colts were "in shock" and "it drove them crazy ... no matter what [the Colts] did, [Snell] would run it the other way". The Colts began their first offensive series on their own 27-yard line. Quarterback Earl Morrall completed a 19-yard pass to tight end John Mackey and then running back Tom Matte ran for 10 yards to place the ball on the Jets' 44-yard line. Jerry Hill's runs of 7 and 5 yards picked up another Colts first down, then Morrall's pass to tight end Tom Mitchell gained 15 yards on third and thirteen and saw the ball placed at the Jets' 19-yard line. In scoring position, Morrall attempted to score quickly against a reeling Jets defense. Receiver Willie Richardson dropped Morrall's pass on first down followed by an incompletion on second down after Mitchell was overthrown. On third down, none of his receivers were open and Morrall was tackled at the line of scrimmage by Al Atkinson. Michaels was brought out to attempt a 27-yard field goal, but it was wide left. "You could almost feel the steam go out of them", said Snell. The Jets did not only rely on Snell; Namath said "if they're going to blitz, then we're going to throw". Shula said that Namath "beat our blitz" with his fast release, which let him quickly dump the football off to a receiver. On the Jets' second possession, Namath threw deep to Maynard, who, despite his pulled hamstring, was open by a step. The ball was overthrown, but this one play helped change the outcome of the game. Fearing the speedy Maynard, the Colts decided to rotate their zone defense to help cover Maynard, leaving Sauer covered one-on-one by Lenny Lyles, helping Sauer catch 8 passes for 133 yards, including a crucial third quarter 39-yard reception that kept a scoring drive alive. The Jets kept rushing Snell to their strong left, rushing off tackle with Boozer blocking the linebacker, and gained first down after first down as the Colts defense gave ground. The Colts defense was more concerned about Maynard, the passing game, and the deep threat of a Namath to Maynard touchdown. Although the Colts were unaware of Maynard's injury, the Jets were aware that Lyles had been weakened by tonsillitis all week, causing them great glee when they saw the one-on-one matchup with Sauer. With less than two minutes left in the period, Colts punter David Lee booted a 51-yard kick that pinned the Jets back at their own 4-yard line. Three plays later, Sauer caught a 3-yard pass from Namath, but fumbled while being tackled by Lyles, and Baltimore linebacker Ron Porter recovered it at New York's 12-yard line. However, on third down (the second play of the second quarter), Morrall's pass was tipped by Jets linebacker Al Atkinson, bounced crazily, high into the air off tight end Tom Mitchell, and was intercepted by Jets cornerback Randy Beverly in the end zone for a touchback. "That was the game in a nutshell," says Matte. Starting from their own 20-yard line, Snell rushed on the next 4 plays, advancing the ball 26 yards. The Jets would have success all day running off left tackle behind the blocking of Winston Hill, who, according to Snell, was overpowering 36-year-old defensive end Ordell Braase, the man who had tormented the rookie Hill in Colts' training camp. Said Snell, "Braase pretty much faded out." Namath later completed 3 consecutive passes, moving the ball to the Colts 23-yard line. Boozer gained just 2 yards on the next play, but Snell followed it up with a 12-yard reception at the 9-yard line and a 5-yard run to the 4-yard line, and capped the drive with a 4-yard touchdown run, once again off left tackle. The score gave the Jets a 7–0 lead, and marked the first time in history that an AFL team led in the Super Bowl. On their next possession, Baltimore went from their own 20-yard line to New York's 15-yard line in three plays, aided by Matte's 58-yard run. However, with 2 minutes left in the half, Morrall was intercepted again, by Sample at the Jets' 2-yard line, deflating the Colts considerably. The Jets then were forced to punt on their ensuing drive, and the Colts advanced the ball to New York's 41-yard line. What followed is one of the most famous plays in Super Bowl history. Baltimore tried a flea flicker play, which had a huge impact on the momentum of the game. Matte ran off right tackle after taking a handoff, then pitched the ball back to Morrall. The play completely fooled the NBC Camera Crew, and the Jets defense, leaving receiver Jimmy Orr wide open near the end zone. However, Morrall failed to spot him and instead threw a pass intended for running back Jerry Hill that was intercepted by Jets safety Jim Hudson as time expired, maintaining the Jets' 7–0 lead at halftime. Earlier in the season, against the Atlanta Falcons, on the same play, Morrall had completed the same pass for a touchdown to Orr, the play's intended target. "I was the primary receiver," Orr said later. "Earl said he just didn't see me. I was open from here to Tampa." "I'm just a lineman, but I looked up and saw Jimmy open," added center Bill Curry. "I don't know what happened." Some speculated that Morrall couldn't see Orr because the Florida A&M marching band (in blue uniforms similar to the Colts) was gathering behind the end zone for the halftime show. The third quarter belonged to the Jets, who controlled the ball for all but three minutes of the period. Baltimore ran only seven offensive plays all quarter, gaining only 11 yards. Matte lost a fumble on the first play from scrimmage in the second half, yet another demoralizing event, which was recovered by linebacker Ralph Baker on the Colts 33-yard line, leading to Turner's 32-yard field goal to increase the Jets' lead, 10–0. Then after forcing the Colts to punt again, Namath completed 4 passes for 40 yards to set up Turner's 30-yard field goal to increase the lead, 13–0. On that drive, Namath temporarily went out of the game after injuring his right thumb, and was replaced by backup quarterback Babe Parilli for a few plays. 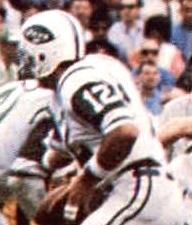 Namath returned by the end of the third quarter, but the Jets would not run a pass play for the entire fourth quarter. Matt Snell said, "By this time, the Colts were pressing. You saw the frustration and worry on all their faces." After Turner's second field goal, with 4 minutes left in the third quarter, Colts head coach Don Shula took Morrall out of the game and put in the sore-armed Johnny Unitas to see if he could provide a spark to Baltimore's offense. Unitas could not get the Colts offense moving on their next drive and they were forced to punt again after 3 plays. Aided by a 39-yard pass from Namath to Sauer, the Jets drove all the way to the Colts 2-yard line. Baltimore's defense would not quit, and kept them out of the end zone. Turner kicked his third field goal early in the final period to make the score 16–0. The Colts' inability to score made Namath so confident by the fourth quarter, that he told Ewbank that he preferred to run out the clock instead of playing aggressively. Namath did not throw any passes in the quarter. On Baltimore's next possession, they managed to drive all the way to the Jets' 25-yard line. However, Beverly ended the drive by intercepting a pass from Unitas in the end zone, the Jets' fourth interception of the game. New York then drove to the Colts 35-yard line with seven consecutive running plays, but ended up with no points after Turner missed a 42-yard field goal attempt. Unitas started out the next drive with three incomplete passes, but completed a key 17-yard pass to Orr on fourth down. Ten plays later, aided by three Jets penalties, Baltimore finally scored a touchdown on a 1-yard run by Hill to cut their deficit to 16–7, but with only 3:19 left in the game. The Colts then recovered an onside kick and drove to the Jets 19-yard line with 3 consecutive completions by Unitas, but his next 3 passes fell incomplete. Instead of kicking a field goal and attempting another onside kick (which would have been necessary in the end), they opted to throw on 4th down, and the pass fell incomplete, turning the ball over on downs. That ended any chance of a Baltimore comeback, as the Jets ran the ball for six plays before being forced to punt. When the Colts got the ball back, only 8 seconds remained in the game. The Colts then attempted two more passes before the game ended. Matt Snell said, "Leaving the field, I saw the Colts were exhausted and in a state of shock. I don't remember any Colt coming over to congratulate me". As he ran off the field, Namath, in a spontaneous show of defiance held up his index finger, signaling "number one"; "the only time I ever did that in my life", he said. Namath finished the game having completed 17 of his 28 passes. He is the only quarterback to win Super Bowl MVP without throwing a touchdown pass. Snell rushed for 121 yards on 30 carries with a touchdown, and caught 4 passes for 40 yards. Sauer caught eight passes for 133 yards. Beverly became the first player in Super Bowl history to record two interceptions. Morrall had a terrible game—just 6 of 17 completions for 71 yards, with 3 interceptions. Through 51 games, he had the third worst passer rating in Super Bowl history, with a 9.3, one of only 3 ratings below 10. Despite not being put into the game until late in the third quarter, Unitas finished with more pass completions (11) and passing yards (110) than Morrall, but he also threw one interception. Matte was the Colts' top rusher with 116 yards on just 11 carries, an average of 10.5 yards per run, and caught 2 passes for 30 yards. The Colts were minus-4 in turnovers throwing four interceptions, all of which were deep in Jet territory. When Sal Marchiano asked Namath in the locker room if he was the "king of the hill", Namath replied "No, no, we're king of the hill. We got the team, brother". Morrall later said, "I thought we would win handily. We'd only lost twice in our last 30 games. I'm still not sure what happened that day at the Orange Bowl, however; it's still hard to account for." Snell wrote, "The most distinct image I have from that whole game is of Ordell Braase and some other guys—not so much Mike Curtis--having a bewildered look". Colts defensive end Bubba Smith later claimed that the game was rigged by the NFL and that Colts owner Caroll Rosenbloom, coach Don Shula, starting quarterback Earl Morrall, and several other players were all part of the conspiracy. The following season, 1969, would be the last one before the AFL-NFL merger. The AFL's Kansas City Chiefs would go on to defeat the NFL's Minnesota Vikings in Super Bowl IV. That victory by the AFL squared the Super Bowl series with the NFL at two games apiece before the two leagues merged into one. As part of the merger, the Colts were one of three NFL teams that moved to the newly formed American Football Conference (AFC) with the Jets and the other AFL teams (the other two were the Cleveland Browns and Pittsburgh Steelers, who were first division rivals in the AFC Central and later the AFC North, with a three-year gap that resulted from the Browns' controversial relocation to Baltimore interrupting it). The former Super Bowl III combatants became divisional rivals in the AFC East until the 2002 realignment shifted the Colts, who had moved to Indianapolis in 1984, to the new AFC South. The teams would however not meet in the playoffs until the 2002 season. And being in the same conference, they can no longer meet in a Super Bowl rematch unless the NFL radically changes its conference alignment or its playoff structure. The Jets have never gone back to the Super Bowl since the merger, only reaching as far as the AFC Championship Game in the 1982, 1998, 2009 and 2010 seasons. On the other hand, the Colts won Super Bowl V (1970), then after relocating to Indianapolis they won Super Bowl XLI (2006) and lost Super Bowl XLIV (2009). However, teams representing Baltimore and New York have contested one Super Bowl since the merger: Super Bowl XXXV between the Jets' crosstown rival (the Giants) and Baltimore's replacement team (the Ravens), with the latter contest being won by Baltimore. This was the first of three occasions in which a team from New York defeated one from Baltimore in postseason play during 1969, with the Knicks eliminating the Bullets in the NBA playoffs, and the Mets upsetting the heavily-favored Orioles in the World Series, being the other two. This was the last postseason victory for the Jets until they beat the Cincinnati Bengals in the 1982–83 playoffs. ^ a b "NBC Broadcast of Super Bowl III". Paley Center for Media. Retrieved January 3, 2013. ^ "Historical Super Bowl Nielsen TV Ratings, 1967–2009 – Ratings". TV by the Numbers. January 18, 2009. Retrieved October 9, 2012. ^ Eskenazi, Gerald (December 15, 2006). "Lamar Hunt, a Force in Football, Dies at 74". The New York Times. Retrieved April 8, 2013. ^ "Top Ten Biggest Upsets: Super Bowl III". NFL.com. ^ Maule, Tex. "Ridiculous! The Nfl By 50 Points". Sports Illustrated. ^ Davis, pp. 296, 311. ^ "Baltimore fires Weeb Ewbank". AP via Tri-City Herald. January 9, 1963. p. 10. Retrieved September 24, 2011. ^ "Rams trample Colts, 34–10, to capture Coastal crown". Canadian Press via The Montreal Gazette. December 18, 1967. p. 42. Retrieved September 17, 2011. ^ "Joe Namath leads NY Jets to arguably biggest upset in history over Baltimore Colts". ^ Green, Jerry. "Green: Morrall remembered for loss in Super Bowl III," The Detroit News, Thursday, February 4, 2016. ^ Gruver, Ed. The American Football League: A Year-by-Year History, 1960-1969. Jefferson, NC: McFarland & Company, Inc., 1997. ^ Zinser, Lynn (May 25, 2012). "Pregame Talk Is Cheap, but This Vow Resonates". The New York Times. p. B10. Archived from the original on May 25, 2012. ^ a b "Football History - Pro Football Hall of Fame Official Site". www.profootballhof.com. ^ a b c d e f g h Joe Namath: A Football Life - The Guarantee (YouTube). NFL Network. March 10, 2015. ^ "Super Bowl - Entertainment". www.nfl.com. ^ a b c "Super Bowl III play-by-play". USA Today. January 11, 2002. Archived from the original on August 25, 2011. Retrieved August 25, 2011. ^ Kriegel, Mark (2004). Namath, A Biography. Penguin Books. ^ "sportsillustrated.cnn.com Super Bowl III". ^ Stuart, Chase (January 20, 2010). "Super Bowl III Play by Play". Pro Football Reference. Archived from the original on August 25, 2011. Retrieved August 25, 2011. ^ "Was Super Bowl III Fixed?". Brandon Steiner. Retrieved December 28, 2018. ^ a b "Super Bowl III". National Football League. Archived from the original on August 27, 2011. Retrieved August 27, 2011. ^ a b "Super Bowl III boxscore". National Football League. Retrieved November 10, 2016. ^ a b c d "Super Bowl III statistics". Pro Football reference.com. Retrieved November 6, 2016. ^ "2016 Official National Football League Record and Factbook" (PDF). National Football League. Retrieved November 7, 2016. ^ "Super Bowl III Gamebook" (PDF). NFLGSIS.com. National Football League. January 12, 1969. Retrieved March 11, 2018.